Last year, we launched the #OneLessPie initiative to use Pi Day (March 14 or 3/14) as a catalyst to improve the data visualization landscape. Many experts have criticized pie charts as a poor way to communicate information, and we listed some of the pitfalls of pie charts last year. But we wanted to encourage people to pair criticism with action by replacing ill-advised pie charts with more effective visualizations. Kaiser Fung remade a Wikipedia pie chart (Junk Charts blog). Jon Schwabish remade a pie chart from an economics journal (PolicyViz blog). 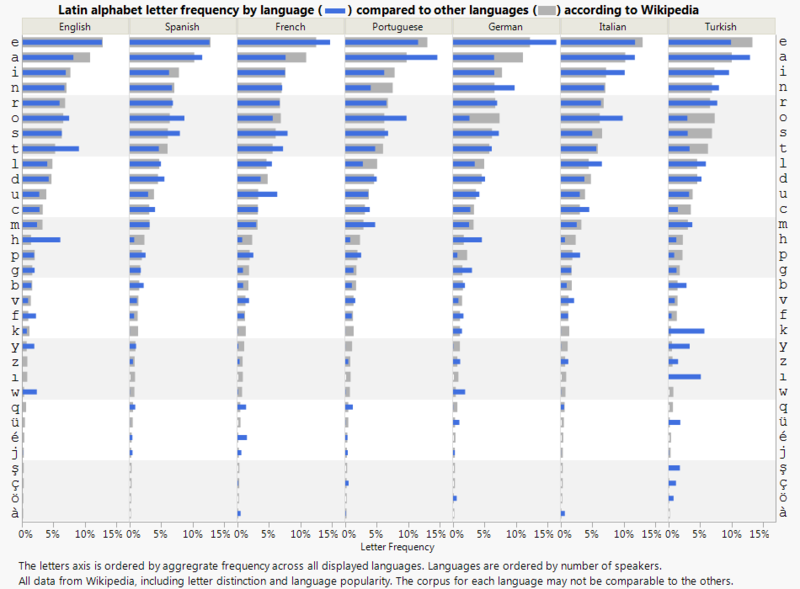 Yours truly remade a Wikipedia pie chart (JMP blog). Alberto Cairo and others added support on Twitter. This year we want to continue to raise the bar, so to speak, and we're giving you a few days of advance notice this time. If you've been bothered by a deceptive pie chart, take action on or around Pi Day (this Saturday) and leave a comment here or tweet with the #onelesspie tag. See the above posts from last year for more motivation and examples. I'll kick things off with a makeover I did a few weeks ago of a kind of pie chart. The social media site Reddit has a couple subreddits devoted to visualizations. r/dataisbeautiful is for "visualizations that effectively convey information," while r/dataisugly is for "butchered visualizations and misleading charts." The following visual had the distinction of being top rated on both subreddits, which epitomizes some of the love/hate dichotomy people have with circular charts. These and other circular charts share many of the faults of pie charts. Interpreting data encoded around a circle is error-prone in general. Even for data that is naturally circular (wind readings), circular charts proved inferior in an experiment in the paper, Graphical Inference for Infovis. 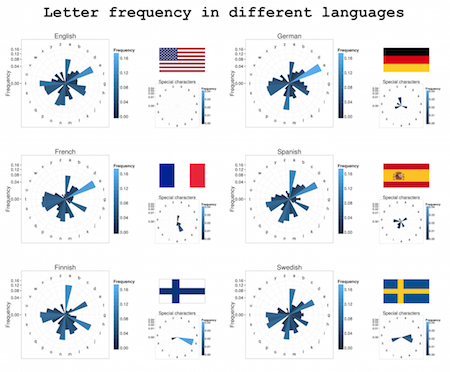 Regarding the letter frequency chart, the task I most wanted to do was compare each language to the others. I tried a few line charts and line/bar combinations but ended up with the bullet chart below. 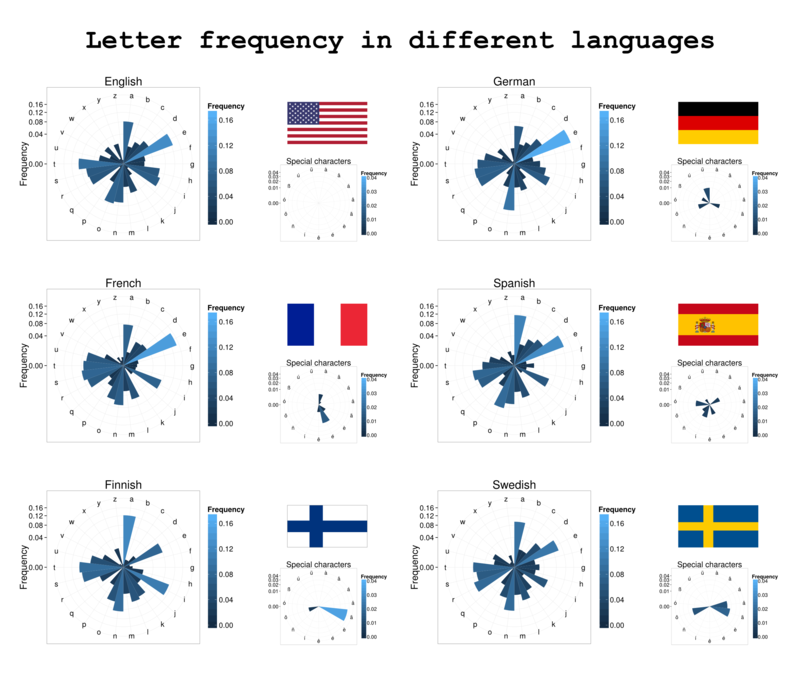 In each column, the blue bar is the letter frequency for that column's language, and the gray bar is the frequency for the other six languages. The rows are ordered by overall frequency. You can see, for instance, that "t" and "h" are disproportionately more common in written English, and that "o" is more common in Portuguese and Italian but less common in German and Turkish. I'll count this as #OneLessPie.